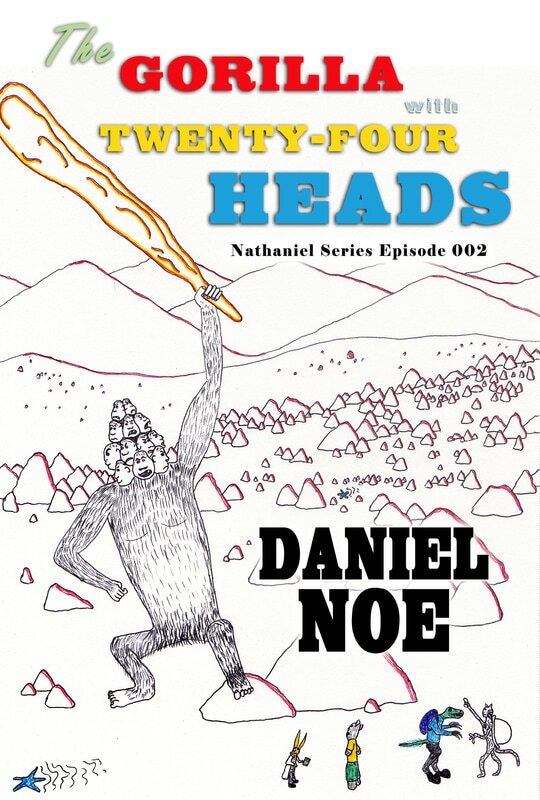 This is the second episode in the series based on the childhood memories of Nate in The Spider, The Witch, And The Spaceship. It is 32,188 words. I did my best to capture the spirit of childhood and the fascination of alien biology inside a space travel adventure. ​Next, they come to an especially large hut and decide to investigate. The roof is supported by internal walls and there is a skylight in its center. The shelves of this hut are stacked with cloth books. Many of them consist of only a single page. Others have as many as a hundred. Nathaniel takes out his still-glowing crystal and passes it over the books to read the titles. There are several subjects represented, including ways to cook stingbushes, the structure of the local government, facts about isosceles triangles, and records of marathon winners. “There are no books here about the carnivorous crystals,” Nathaniel comments. “If the monkeys sleep all night, they probably don’t even know about them,” Haticat says. “Hey, here’s a book of city rules,” Fred says. The boys skim through it. • It is illegal to shoot catapults. • It is illegal to build catapults. • It is illegal to load catapults. • It is illegal to climb walls, especially with a catapult. • It is illegal to not brush your teeth. • It is illegal to knock out your sister’s teeth with a catapult even if she asks you to. • It is illegal to sleep while standing and balanced on your horn. • It is illegal to question the rules. • It is illegal for anyone other than an adult to cut your fur. • It is illegal to drink the last of the juice. “These rules don’t make any sense. Why is it illegal to not brush your teeth? You can’t brush your teeth all the time,” Nathaniel complains. “Yup. Not even adults can brush their teeth while they’re sleeping,” Haticat says. “And somebody has to drink the last of the juice or else it will stay forever and spoil,” Nathaniel says. “These rules are garbage!” Fred exclaims. “Indeed. It is very easy to accidentally cut another’s fur when playing barber shop, but it isn’t your fault if someone else cuts your fur; it’s their fault,” Doctor Bill says. “Yeah! Why should you get punished for what somebody else does?” Nathaniel says. Fred tosses the book away in disgust and they continue to look around the library. There is a brick table in one corner with two clay basins on it. One has ink and the other has soapy water. A thin sheet of ice sits across the top of the water. “Why is this ink and water here?” Haticat asks. “I don’t know,” Doctor Bill admits. Nathaniel investigates several pieces of cloth on the table. They are partly scribbled on. “Oh, maybe this is what they use for writing and drawing paper. Maybe it’s hard to make new cloth so they reuse it by washing the ink out in the water to erase it,” Nathaniel suggests. On the cover we see Nathaniel, Haticat, Fred, and Doctor Bill being caught by surprise by The Gorilla in the deserts of planet Tizin-A.